The plaque mounted on the stone base commemorates the Elk Mountain Mission Fort. The plaque pictured below is mounted on the front of the church. This stuccoed adobe structure is typical pioneer architecture, constructed of locally-available materials through the efforts of many local citizens. The Greek Revival T-shape plan reveals the rapid growth of LDS Church membership during Moab's early years of settlement. This structure was the only religious building in Moab until 1910, when the Baptist chapel was formally dedicated. The Moab area was long of interest to many groups because the Colorado River could be easily crossed at that point. Moab (then unnamed) was on the Old Spanish Trail. It was the site of the Mormon Elk Mountain Mission from 1854 to 185555 and was sporadically used as grazing lands for cattlemen from both Utah and Colorado in the 1860s and 1870s. Both Utes and Piutes claimed the land, and were partially responsible for the quick demise of the Elk Mountain Mission. When Moab was founded March 23, 1880, with the opening of the post office, most of the inhabitants were Mormons. A year after the founding, visiting LDS officials organized the Moab Ward. In 1888 church construction began. Labor, money, and materials were donated by church members. However, even as the building rose, Moab's population increased. When church members congregated for the first service in 1889, the building proved too small. Another room was added sometime prior to 1900, resulting in the present "T" configuration. The building remained a church until 1925 when a new church was built to accommodate the growing congregation. 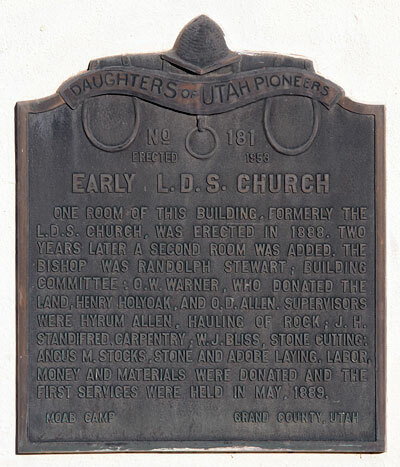 The original LDS Church was deeded to the Grand County School District, which still retains ownership. The building was vacant from 1925 until 1937 when the Grand County Camp of the Daughters of Utah Pioneers (DUP) began meeting here. Daughter Mary donated an organ, which remains in the building, and Daughter Mabel donated a stove. Daughters took turns furnishing coal and kindling and in starting the fires on meeting nights. Daughters installed linoleum removed from the local hospital, for which they had made curtains. In 1938, the Daughters organized a committee for gathering relics. 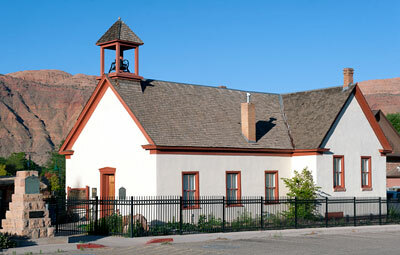 The building has continued to serve as a DUP meeting place and Relic Hall except for the years 1954 through 1964 when, during the uranium boom, the school district reclaimed the building for classrooms. Excerpted from the NRHP nomination submitted in 1980.